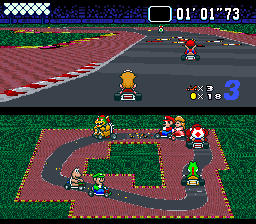 Work in progress Super Mario Kart hack I've been at for almost 2 weeks now. 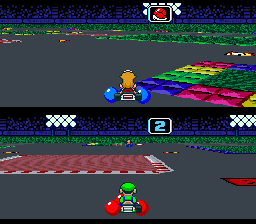 I mainly aim to replace all of the original game's track layouts and completely redraw all of their graphics (coming up with entirely new themes in the process). 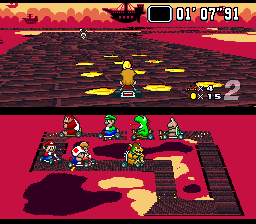 It's about 25% complete now, with Mushroom Cup & a battle course being finished. 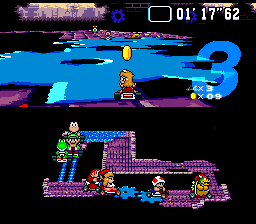 At the end I might be interested in making very minor gameplay tweaks, but we'll see. 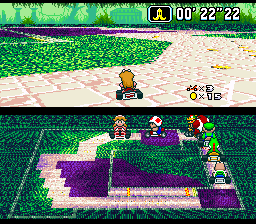 It's great to see the original Mario Kart get hacks like this. 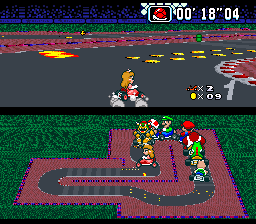 I only wish F-Zero got the same treatment. It'd be a shame to change the title! I came here just to say how clever I thought it was. 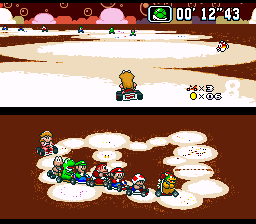 Makes me wish someone could further polish that "Full-Screen Super Mario Kart" hack. 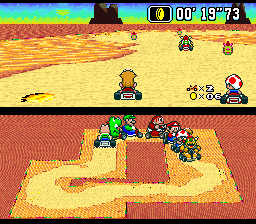 These new tracks would look absolutely divine on a full-screen level. 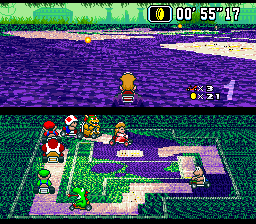 This is looking like a fun SMK hack, the screens look really cool, too.